Fordham Hill is known as the “Oasis in the Bronx ”. A gated community located in the University Heights section of the Bronx, our complex consists of 1,130 apartments in nine high-rise buildings situated in a campus-like atmosphere known as “the Oval”. 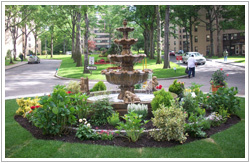 Our property has 7 acres of beautifully landscaped grounds boasting green lawns and stately trees. Our “Oval” is a haven for wildlife including many species of birds and our famous black squirrels. In addition to many other amenities, the property has outdoor sitting areas, a central fountain and a playground for children. Fordham Hill consists of 1, 2 and 3 bedroom apartments with electric and cable included in the maintenance. Many of our apartments have sweeping views of the Harlem River! There is a convenient parking garage that provides discounted rates for Fordham Hill shareholders. Fordham Hill has onsite Management, Security, Maintenance and a central Package Room. Fordham Hill is conveniently located close to shopping, restaurants like the famous Arthur Avenue, the Bronx Zoo, the Botanical Gardens and Yankee Stadium. We are also located close to Education Row and all major transit and highways. We are only minutes from Manhattan, New Jersey and Westchester! 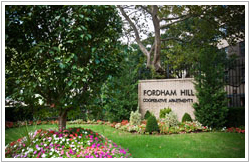 Fordham Hill is about community and there are many community-sponsored activities and events for residents of all ages.